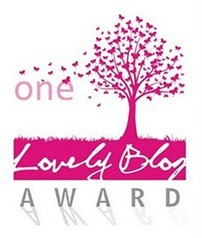 A couple of days ago Michelle gd over at A Way of Being nominated me for the One Lovely Blog Award. I am new to this and you made me feel special. Thank you!! 2. Thank the blogger(s) who gave it to you. 5. Award up to 15 bloggers. Campfires, marshmallows & smores make me giddy. I don’t like bike riding – as much as I have tried I just really don’t enjoy it! I love cats…my first word was the name of my first cat, Fishy. I would love to learn to play the harmonica, speak fluent french and make a movie one day. I have been collecting fortunes from fortune cookies for over 5 years to do a special art project with, you can find them in corners and drawers around my house. My father is a rocket scientist… No joke! Please If you have a few moments check it out I think you’ll enjoy it. Thank you so much. I am really honoured . I am putting the award in my blog now. so fun to learn these things about you!